Oui c'est vrai Olivier c'est une sacrée chance !! Ce jeudi 30 juillet à 10.00 Hr, le chasseur de mines M921 LOBELIA, sous le commandement du Premier Lieutenant de Vaisseau Pascale Van Leeuwen, est parti pour une mission de quatre mois et demi. 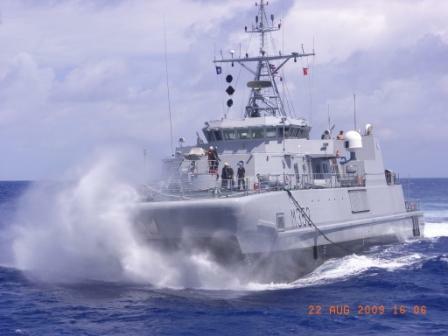 Durant cette période, ce chasseur de mines fera partie de l'Escadre OTAN "Standing NATO Mine Counter Measure Group 1" (SNMCMG1). Cette Escadre maritime multinationale sera active au large de la côte Est des Etats-Unis. Ces navires feront successivement escale en Angleterre, en Espagne, aux Azores, aux Iles Vierges, au Canada, aux Etats-Unis, aux Bermudes, en France, en Allemagne et au Danemark. Depuis sa fondation, cette Escadre a démontré son habilité à jouer un rôle déterminant comme "Mine Countermeasures Immediate Reaction Force" de l'OTAN. En effet, cette force multinationale de chasseurs de mines et de dragueurs de mines, constituée des meilleures unités de guerre contre les mines, est connue comme étant la mieux entraînée. Compte tenu de leurs spécialisations, ces navires ainsi que leurs équipages sont parés à exécuter leurs missions partout dans le monde. Le navire est attendu dans son port d'attache de Zeebrugge le 18 décembre 2009. Vanaf het begin heeft het vlootverband een operationele capaciteit opgebouwd en bewezen gereed te zijn om haar primaire rol als één van NATO's Mine Countermeasures Immediate Reaction Forces te vervullen. SNMCMG1 wordt beschouwd als één van best getrainde en best uitgeruste mijnenbestrijdingsverbanden, klaar om elke opdracht waar ter wereld ook uit te voeren. Le LOBELIA arrive à Vigo (en Espagne) le 12 août 2009. The Standing NATO Mine Countermeasures Group No1 (SNMCMG1) is currently crossing the Atlantic en-route to the American East coast in order to take part in both Canadian and American joint exercises. The Group will conduct an official visit to New York City where they will hold a NATO 9/11 Commemoration Ceremony. SNMCMG1 usually operates in the waters of northern Europe, however, MCC Northwood occasionally tests the ability to deploy over longer distances, and sustain MCM operations out of area. To that end, it has been 11 years since SNMCMG1 operated on the American East coast. At present SNMCMG1 consists of the Flag Ship HDMS THETIS, four Mine Hunters and one Mine Sweeper from the Netherlands, Belgium, Estonia, United Kingdom and Norway. The group is scheduled to conduct operations along the North American East coast from late August until early October. During this period two Canadian Mine Hunters and four Canadian staff officers will join the Group. Throughout the deployment, the five MCMV’s will frequently be supplied with fuel form an astern replenishment system onboard HDMS THETIS, the system being kindly provided by the Norwegian Navy. It will come as no surprise to learn that the demand for fuel during an Atlantic passage is high. 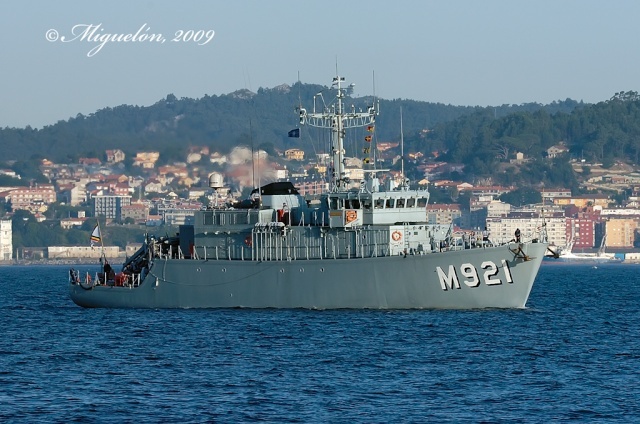 Therefore, in order to ensure the groups sustainability HDMS THETIS seized the opportunity to rendezvous with USNS PATUXENT, mid way between the Azores and Nova Scotia, in order to top up with some 300 cubic meters of fuel from the American Fleet Tanker. The encounter was brief but the benefit was great and above all, it is good to know that there is always someone looking out for you. HALIFAX (N.-É.) 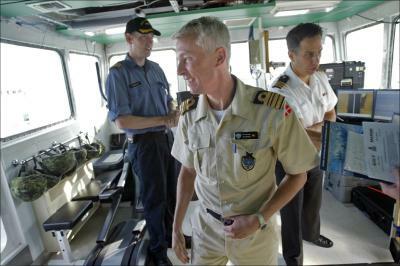 – Les membres des médias sont invités à l'arsenal canadien de Sa Majesté le mardi 1er septembre 2009 en matinée pour rencontrer le commandant du 1er Groupe permanent de la flotte de lutte contre les mines de l'OTAN (SNMCMG1), le Capitaine de frégate Henrik Holck Rasmussen de la marine royale danoise. Les représentants des médias auront l'occasion de monter à bord d'un navire militaire canadien et d'accompagner le 1er Groupe pour son départ du port d'Halifax. Les membres des médias auront du même coup la chance de rencontrer des marins canadiens. 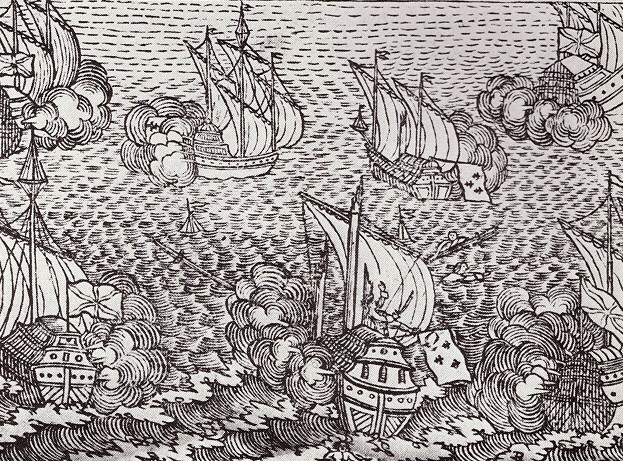 Le groupe est formé de six navires du Danemark, de l'Estonie, de la Norvège, de la Belgique, des Pays-bas et du Royaume-Uni. Le Capitaine de frégate Rasmussen et le Capitaine de frégate Chris Ross, commandant de la Division côtière des Forces maritimes de l'Atlantique, feront de courtes déclarations et répondront ensuite aux questions des journalistes. Tout de suite après, le SNMCMG1 se préparera à quitter Halifax pour participer à un exercice aux côtés de navires militaires canadiens. Les membres des médias pourront prendre place à bord du NCSM Goose Bay qui se positionnera dans le port afin de bien voir le départ du groupe. Le SNMCMG1 est l'une des deux flottes de l'OTAN spécialisées dans la lutte contre les mines. Il est une force multinationale permanente composée de dragueurs de mines. Toujours en service, cette force donne à l'OTAN une capacité d'intervention dans le cadre d'un grand nombre de missions partout dans le monde. 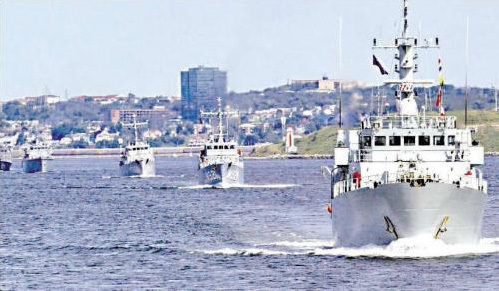 Standing NATO Mine Countermeasures Group 1 (SNMCMG1) led by the flagship, HDMS THETIS, arrived in Halifax, Nova Scotia, Canada on 28th August 2009 where two KINGSTON Class Mine Hunters officially joined the group. The integration of the two Canadian units marks an historic occasion, as this is the first time Canadian Mine Hunters have ever officially join SNMCMG1. The historic day was marked by an official reception onboard the flagship with attendance from all of the current participating ships, the canadian navy and an MCC Northwood VIP, DCOS OPS, Cdre Hans Helseth (NOR N), who made the journey from the UK to witness the occasion and congratulate the Canadian Navy and SNMCMG1 on their achievement which now brings the group up to 8 units. The KINGSTON Class Mine Hunters operate High Tech Side Scan Sonars and Clearance Divers, bringing different equipment, knowledge and experience to the team. The two Canadian Navy Mine Hunters will be a part of SNMCMG1 until early October 2009, when the MCM Group will return to the familiar waters of Europe. On completion of a Pre Sail Conference, SNMCMG1 will sail from Halifax for a one week mine countermeasures exercise in Canadian waters prior to transiting south in order to take part in a large scale Carrier Strike Group joint exercise with the US Navy. 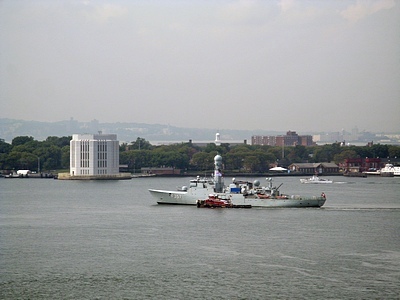 Prior to the American Exercise SNMCMG1 will conduct an official visit to New York where they will lead a NATO wreath laying ceremony at the World Trade Centre site on 10 Sep 09 and host a NATO 9/11 Commemoration Ceremony on the evening of 11 Sep 09. Ships belonging to the Standing NATO Mine Countermeasures Group 1 (SNMCMG1), depart Halifax harbour for a joint excercise on the eastern seaboard, yesterday. Ships and countries taking part in the group are, from left, Denmark's HMDS Thetis, Norway's HNOMS Rauma, Estonia's ENS Sakala, Britain's HMS Quorn, Netherland's HNLMS URK, Belgium's BNS Lobelia and HMCS Goose Bay from Canada. Two Canadian navy minesweepers sailed out of Halifax Harbour Tuesday with six NATO ships for several weeks of joint exercises. The six other ships make up one of NATO’s two standing mine countermeasure groups that operate continuously to respond to any situation anywhere. This is the first time in 11 years the group has been on this side of the Atlantic because there is so much work to be done around Europe. Cmdr. Henrik Holck Rasmussen of the Royal Danish Navy commands the group, and said there are an estimated 500,000 Second World War mines sitting on the bottom of the ocean around the coast of Europe, in the Baltic and the North Sea, particularly in the English Channel. That means there is plenty of work to do. "It’s going to take a long time," he said. The mines and ditched aircraft bombs still pose a threat, even though they have sunk to the bottom of the ocean. Cmdr. Rasmussen said that a Dutch fishing boat hauled in its catch on a dark night in 2005 and dropped what felt like a good haul of fish onto the deck. The catch was actually an old mine that exploded on impact, killing the three crew members. He said the group has removed 22,000 kilograms of ordinance from the sea floor this year, including 43 mines and bombs. Coming to this side of the Atlantic lets the group, made up of ships from Denmark, Estonia, Norway, Belgium, the Netherlands and the United Kingdom, work in different waters and test their ability to travel long distances. Because the minesweepers are smaller naval vessels, they need to be resupplied more often during long ocean voyages. Cmdr. Chris Ross, who is responsible for the six Canadian minesweepers on the Atlantic coast, said this is the first time Canadian ships have formally joined the group, although they have worked with it before. "This is the first time we’ve been able to fly the NATO flag on these ships and display the NATO crest on our bridge wings, and we’re very proud to have that opportunity," he said on the HMCS Shawinigan, which joins the HMCS Goosebay in the exercise. He said the exercises will expose Canadian sailors to their NATO allies’ practices and procedures and refine their own mine warfare skills and expertise. After a week of exercises in Canadian waters, the ships will head to New York for a 2 1/2-week exercise along the eastern seaboard. Royal Danish Navy Commander Henrick Holck Rasmussen, commander of the Standing NATO Mine Countermeasures Group 1 smiles on the bridge of HMCS Shawinigan before the departure of the group for a joint excercise on Tuesday. Belgium’s BNS Lobelia and Dutch minesweeper HNLMS URK, right, separate from Britain’s HMS Quorn, Estonia’s ENS Sakala and Norway’s HNOMS Rauma while leaving Halifax Harbour off Chebucto Head on Tuesday. BHB photo by C. Scales - The Danish frigate HMDS Thetis from the Brooklyn Bridge this morning. She was approaching Pier 7, at the foot of Atlantic Avenue, where she is now docked. I hope the bars along Atlantic are well stocked with Carlsberg beer. Thetis is visiting New York along with nine other ships from various nations, making up NATO Mine Counter-Measures Group 1. 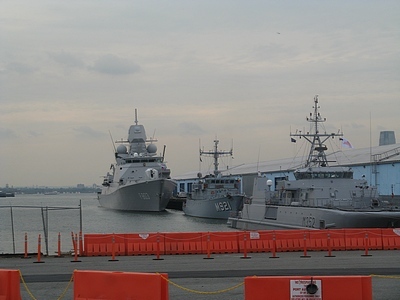 BHB photo by C. Scales - Docked at the south side of Pier 7, front to rear, are: the Norwegian minesweeper KNM Rauma, the Belgian minesweeper BNS Lobelia, and the Dutch frigate HNLMS Tromp. Not pictured, on the north side of Pier 7, docked in front of Thetis, is the Dutch minesweeper HNLMS Urk. NEW YORK - SEPTEMBER 08: A flotilla of 11 ships comprised of Dutch Naval Frigates, NATO vessels, Dutch barges, and a replica of Henry Hudson�s 'Half Moon' sail past the USS Intrepid during kick-off festivities celebrating the NY400 Week at the Intrepid Sea, Air and Space Museum on September 8, 2009 in New York, New York. NY400 Week, which runs from September 8-13, marks the 400th anniversary of Henry Hudson's arrival on a Dutch ship to New York harbor in 1609. 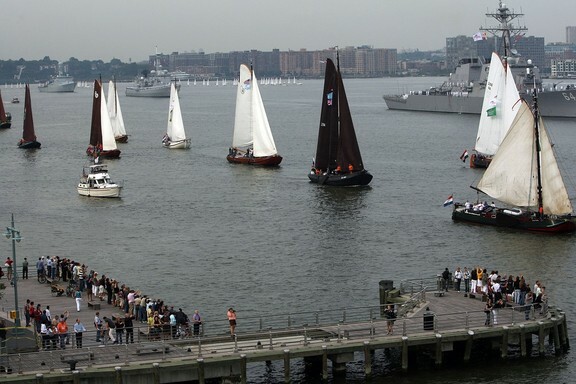 New York will celebrate the event with Dutch festivals, boat races, dance parties, museum exhibitions and more. "Mieux encore, en 1623 des protestants hennuyers rejoignent les Pays-Bas et s’embarquent pour les Amériques. Ils s’établissent sur une ile nommée par les indiens « Manhattan ». Le fondateur de la colonie est le wallon Jesse de Forest qui appelle la nouvelle colonie « Novum Belgium ».Le premier gouverneur est le wallon Pierre Minuit , originaire d’Ohain. L’arrivée massive de nouveaux immigrants fera changer la colonie de nom pour « Nouvelle Amsterdam », leur lieu de départ, et lorsqu’elle passera sous commandement anglais elle deviendra la « Nouvelle York », selon le même principe. Et toujours mieux,si tout le monde sait que les tous premiers émigrants puritains anglais arrivèrent le 6 septembre 1620 en Amérique à bord du May Flower et qu’ils fondèrent la toute première colonie d’européens : New Plymouth, qui se souvient encore du fait que le pilote de ce bateau était un bruxellois nommé Schepens, né apparement Rue au Beurre ?" Merci pour toutes ces infos et images du Lobelia, car à part les mails rien ne passe. pas de courrier depuis leur départ, là on na voir. C'est un plaisir de suivre les navires tout au long de leur voyage. Tu as de la famille à bord du Lobelia ?